Form: A succulent treated as a shrub. Growth rate: Slow to moderate depending upon water and temperature. Mature Size: The flower stalks can grow to 6' high. The narrow leaves at the base usually cover an area 2' high and 3' wide. 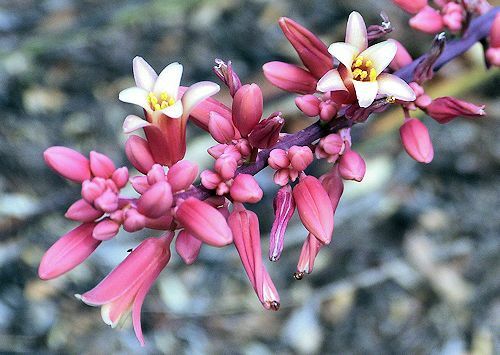 Flowers: Reddish tubular flowers, with yellow throats, sprout from narrow spikes on pink stalks. Other flower colors are available. Fruit: A round seed capsule containing flat, black seeds. Leaves: Long, narrow, blue-green, arching, stiff blades grow from a central base. White fraying fibers line the leaf margins. 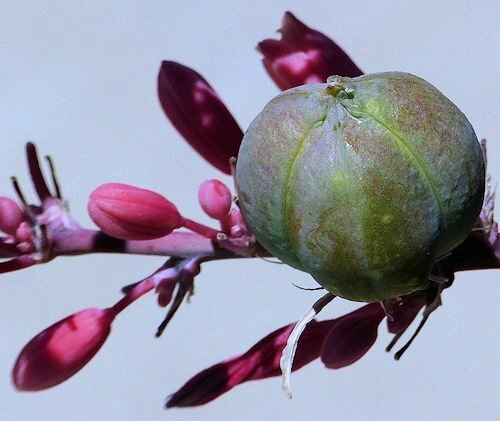 Stems: No thorns or spines. Wildlife: The flowers attract hummingbirds and foraging deer. The leaves are resistant to deer but not javelina. Toxic / Danger: The leaves and fruit are toxic. Origin: Native to Texas and northern Mexico. Water once established: Once a month during drought. Soil: Very well drained, pH 5.1-9.0 (highly acidic to highly alkaline). Prune: Remove old flower stalks as needed. Propagation: Seed or root division. Now recognized as a member of the Asparagaceae (asparagus) family, it was formerly classified in the discontinued Agavaceae (century plant) family. 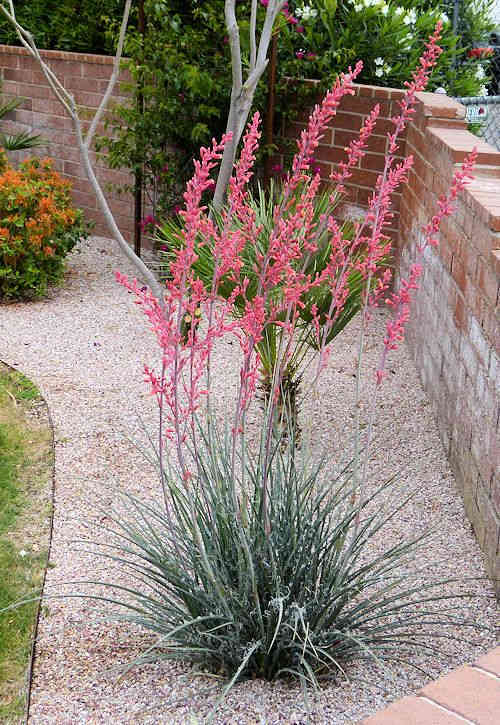 It is not a true yucca, although distantly related.